“Some of the transfers were induced through panic, and nowhere was this more apparent than in a fruitless scramble after Alfredo di Stefano in August 1964. The famed striker of Real Madrid had been released from his contract by the Spanish club, and Celtic embarked on a wild goose chase to land the South American superstar. The club phoned Spain, but the player was on holiday and the calls were not returned; the club sent telegrams but these were ignored, until a belated reply rejecting the offer finally arrived at Celtic Park. Despite the player’s manifest lack of interest and unavailability (he had recently agreed a lucrative one year contract with Espanol) the club ordered Jimmy McGrory to make a hurried, undignified trip to Spain, accompanied by John Cushley, Celtic’s reserve centre-half and a graduate in languages from Glasgow University, in a futile bid to change his mind. It was fortunate for Celtic that di Stefano dismissed the overtures. Magnificent player that he was, di Stefano had an arrogant streak and ruled imperiously at Madrid for years. Well substantiated rumours were disconcerting; he insisted that passes be made directly to his feet and ignored others; he forced Didi, Brazil’s World Cup star, to quit Madrid because his vanity would not allow a newcomer to usurp his popularity; he accepted Puskas as a team-mate only when the Hungarian wisely gave up a chance to score in order to lay on a goal for him, a goal that gained for di Stefano the Spanish leading scorer title. “On 7th June 1967, fresh from the pinnacle of achievement in the European Cup Final, the Lisbon Lions entered the cauldron of the Santiago Bernabeu Stadium in Madrid to have their new stature tested in the fiercest of fires. Real threw everything at Celtic in an attempt to re-assert themselves in a ‘friendly’ against their immediate successors as European Champions but the flowering Parkhead maturity prevailed for a 1-0 victory, courtesy of an inspired performance by goalkeeper John Fallon, the solitary strike of Bobby Lennox and a scintillating display by Jimmy Johnstone, who received a standing ovation. This was the icing on the Lisbon cake, at the personal invitation of the great Alfredo di Stefano, who had wanted nothing but the best for his own benefit match. “Almost a fortnight after Lisbon a leg-weary and slightly fractious team took the field in the Bernabeu to play Real Madrid. 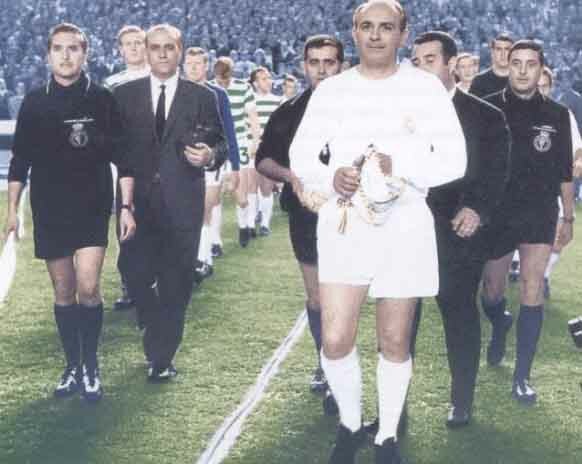 Only the honour of appearing in the great di Stefano’s benefit match had tempted Celtic to accept the invitation. Real, European Cup winners of 1966, were desperate to demonstrate their superiority to the new holders. John Fallon, who had been on the bench as goalkeeping substitute in each European match that season, was given the chance to demonstrate his worth. While Celtic struggled, he held Real at bay. As time passed Celtic’s competitive instincts began to surface once more. In the 69th minute they produced the only goal of the game. Jimmy Johnstone left half a dozen opponents in his wake and slipped the ball through to Bobby Lennox in the inside-right channel.